Enlarge/ The Jeep Compass Latitude is ready for all of your off-roading needs. The subcompact Compass is unmistakably a Jeep. 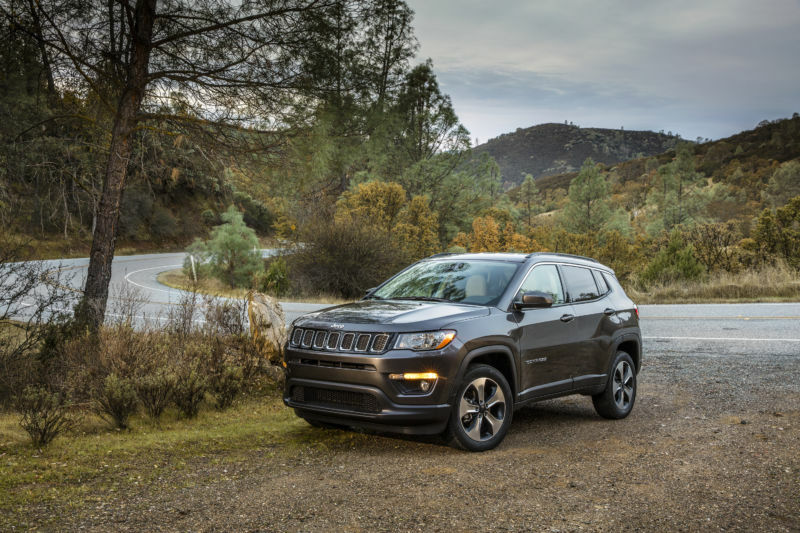 It has the familiar and iconic black, seven-slot grille with chrome accents, and the silhouette it cuts makes it look like the Cherokee. Built on parent company Fiat Chrysler Automobile’s “small-wide” 4×4 architecture, the Compass sports four-wheel independent suspension with up to 8.5 inches of ground clearance. Selectable drive modes include auto, mud, snow, and sand, and it can tow up to 2,000lb (907kg). Rain, snow, and a shorter-than-usual loan resulted in our having to use press photos for the exterior. Front view of the Jeep Compass. A Jeep Compass about to drive into the woods. The front row of the Compass. I’m not a fan of the positioning of the uConnect display and climate control. CarPlay and Android Auto are both supported. Note that some uConnect functions are still accessible with CarPlay running, which is great. You can only turn on the heated steering wheel and seats from the touchscreen. I had those set to come on whenever the car started, but it didn’t always happen. The back seats of the Compass were surprisingly comfortable. There’s a USB port back there for charging smartphones. Over 27 cubic feet of cargo space in the Compass. Moving the daughter back home from college for a few weeks. The interior of the Compass is well thought-out, with a couple of small exceptions. Once you sit in the powered, eight-way driver’s seat, you’re in the ideal SUV-driving position. The thick steering wheel has some heft, and FCA’s control layout continues to impress. Radio/media controls are on the back of the steering wheel, the instrument cluster and phone are on the left, and the driver-assist functions are on the right. The layout is smart and uncluttered. A good-sized HD display is nestled between the analog tachometer and speedometer, and it’s easily configured to show whatever information you deem most relevant. Like most of the FCA badges, Jeep uses uConnect for the infotainment system. The more experience I have with other infotainment systems, the more I like uConnect. It’s easily the best infotainment system in a mainstream vehicle, and it’s arguably the best touchscreen-only UI on the market. Unfortunately, Jeep didn’t bother to angle the screen toward the driver at all. Directly underneath the display are the climate controls, and, unlike most cars, they’re not angled forward at all, so you’ll need to reach to turn on the heat or AC. That said, uConnect gives you the option of accessing the climate controls via the touchscreen. CarPlay and Android Auto are both included with the 8.4-inch touchscreen. Interior styling is sharp. Seats are leather-trimmed, and the black stitching on the door panels gives the Compass a comfortable but understated stylishness. The interior is comfortable, and normal-sized adults in the back seat won’t have any reason to hold a grudge, even with the panoramic moonroof reducing the amount of headroom available. The driver’s seat even has enough space for some manspreading, which is not always the case with sub-compact SUVs. There’s an impressive amount of cargo room for a subcompact as well—27.2 cubic feet, 59.8 cubic feet with the seats down. We drove the Compass to pick our daughter up from college, as the end of the fall quarter coincided with the vehicle loan. The vehicle easily fit a pillow, a couple of suitcases, and other miscellany needed for a seven-week stay with mom and dad. I largely enjoyed driving the Compass. The handling and ride are unremarkable in a good way. If I had to describe how it handled—and I do, since this is a car review—I’d call it “SUV Lite.” There’s a slight feeling of top-heaviness if you’re too aggressive on a curve, but the rest of the time, the Compass is rock steady. The suspension shields passengers from rough bits of road, and although it’s no speed demon, the 2.4-liter inline-four gets the job done around the suburbs and on the highway. Aside from some wind noise around the B pillars that shows up around 70mph, the Compass Latitude offers a fairly quiet ride. The Compass is rated at 22mpg in the city, 30mpg on the highway, and 25mpg overall. In five days of driving that combined interstates, country roads, and suburbs, I got 22.3mpg. Like other OEMs, Jeep boosts mileage by having the engine shut off when the car comes to a complete stop at a stoplight or intersection. On a few occasions, the car took what I can only describe as slightly too long to start back up, and when it did so, there was a slight, but noticeable lurching. My other quibbles with the Compass are few and far between. There’s the aforementioned wind noise at higher speeds and the way the center console is laid out. In addition, the uConnect setting that makes the steering wheel and seat heat come on automatically on startup works most, but not all, of the time. That’s a bummer when it’s 20° outside and you don’t have an attached garage. There’s also no option for adaptive cruise control. But that’s small stuff. Jeep knows what it’s doing when it comes to building SUVs, and the Compass is no exception. The company has built a solid sub-compact SUV that offers excellent value, a surprisingly spacious-feeling interior, and a solid ride. If you’re in the market for a sub-compact SUV, the Compass is a solid contender at its price point.